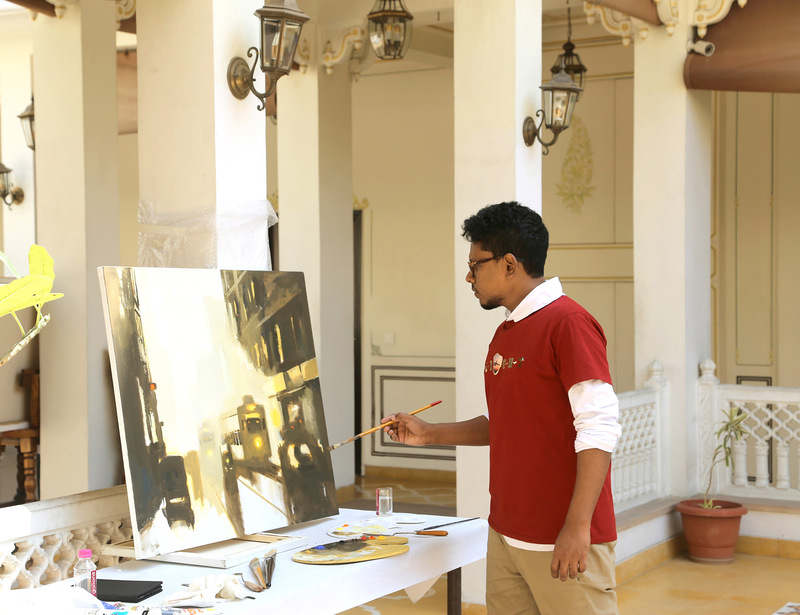 It was an amazing art camp spent in Jaipur last week. And as I am back in Mumbai now I am excited to share them with you. 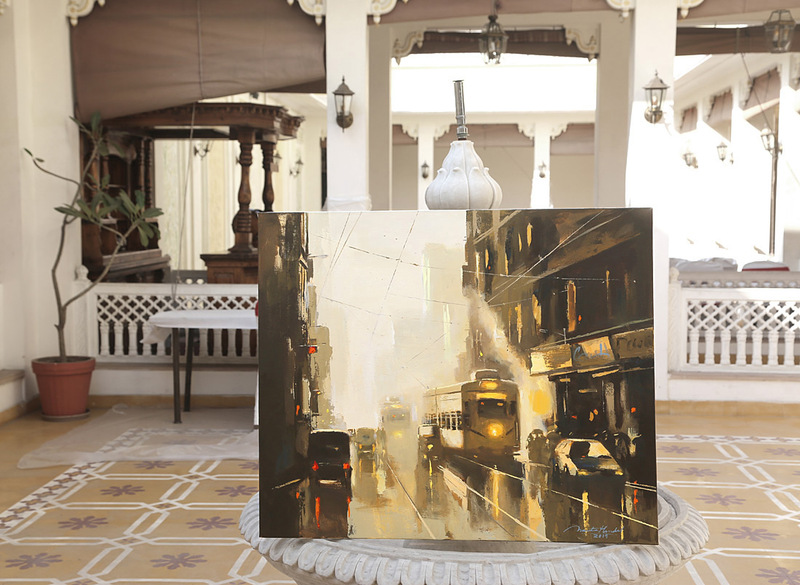 The Art Camp ‘Urban Views’ presented by The Heidelberg Cement – Gallery One Art Retreat was chosen to be held at one of the most luxurious hotel in Jaipur, The Grand Uniara, A Heritage Hotel. On arrival I was received straight from the airport to the Hotel. For sure the welcome was grand and elegant at its best. 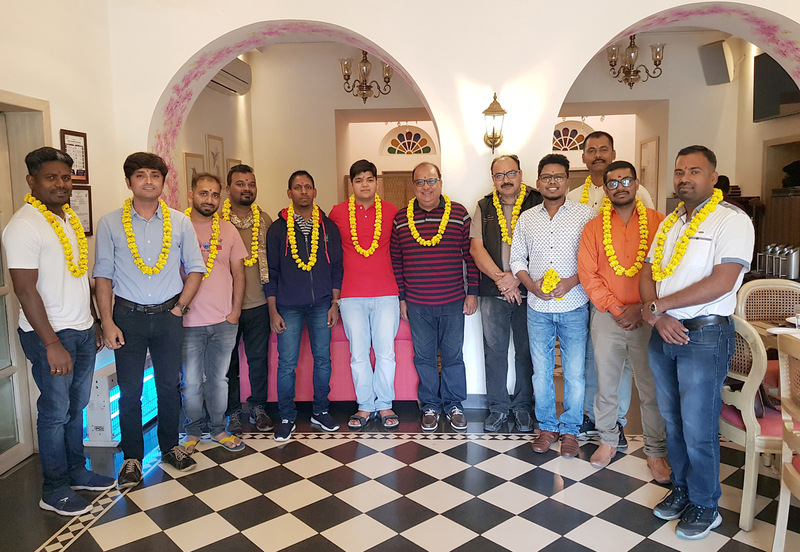 This destination in the heart of Jaipur, few distance from the mighty Moti Doongri Hills was itself a charm of Royal entities, rich folk tales & anecdotes unfolded by the antiques, paintings and decor as we roamed everywhere. This camp became more exciting as we were 10 artists joining from Mumbai, Goa , Belgaum , Kolkata, Hyderabad, Delhi, Jaipur and Nashik as well. The distinctive combination seemed to be fun and thrilling while creating art and revealing new concepts and ideas together. One can imagine how much creativity was flowing in the breeze of every corner of the big corridors while we all artists were painting the canvases with bold and lustrous colors in a sense of making outstanding impressions of thoughts. Jaipur known as the pink city specially for its quintessential pink tinted architectures. Palaces of Jaipur were built by the royal families uniting story of grandeur and opulence. Once upon a time being Royal residences encircled by lush gardens and courtyards are now museums of royal artifacts. 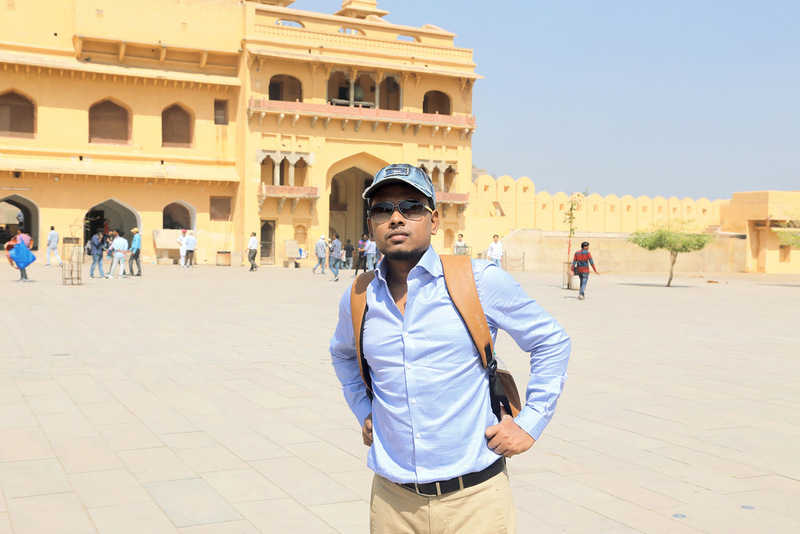 The arrival day began with the feast to witness the Palace of the Winds, Hawa Mahal at the sunset. It beholds the delicate and mesmerizing glory of Rajput architecture. A bee-hive shaped five-storey palace built around an intricate latticework in red and pink sandstone has near to thousand windows designed to allow royal ladies to observe everyday life and festivals celebrated in the street. The day before we leave was another splendid and mindful affair when we entered to the Amer Palace. 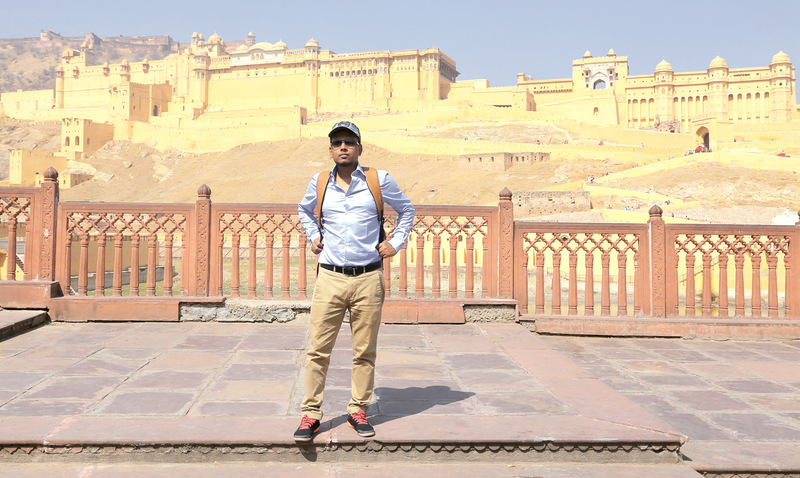 This is an extensive palace made completely of pale yellow sandstone. The massive fort glows beautifully in the soft morning light and looked really majestic as we approached it from afar. Though I visited Amer Palace long before but the glimmering heritage of creativity always enthrals eyes to get hypnotized in the dazzling craftsmanship again and again. So in all when it comes to Jaipur the appetizing Rajasthani cuisine, heritage architectures of Maharajas, incredible views of the romantic pink city and Royal tale conveyed by antiques, paintings and craftsman ships of the palaces is a sensational rejuvenation to the mind and soul. 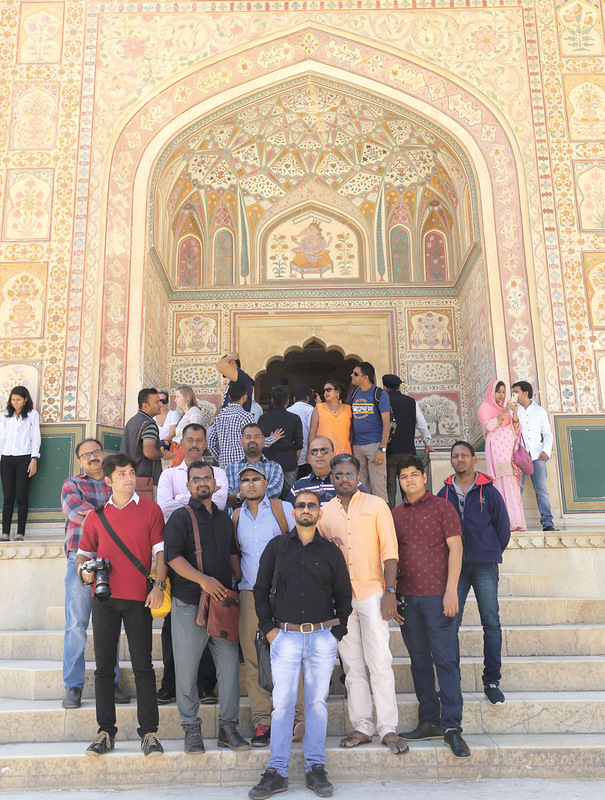 I would love to say it was such a splendid tour and paintings in the heart of this unrivaled pink city of Heritage and Royal culture in the uniformity of obsolete and contemporary era. My warm regard to Neeraj Ji, Mr. J. N. Cooper for their diligent initiatives to make this camp happens. 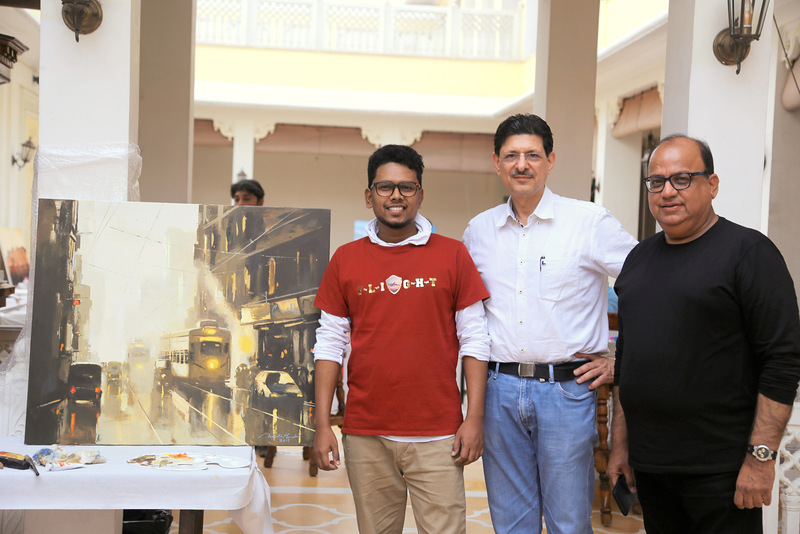 My heartiest thanks to Deepak for putting his effort to the fullest in the camp days and all our Artists team, without you the fun and adventure in creativity was not enough to be explored. 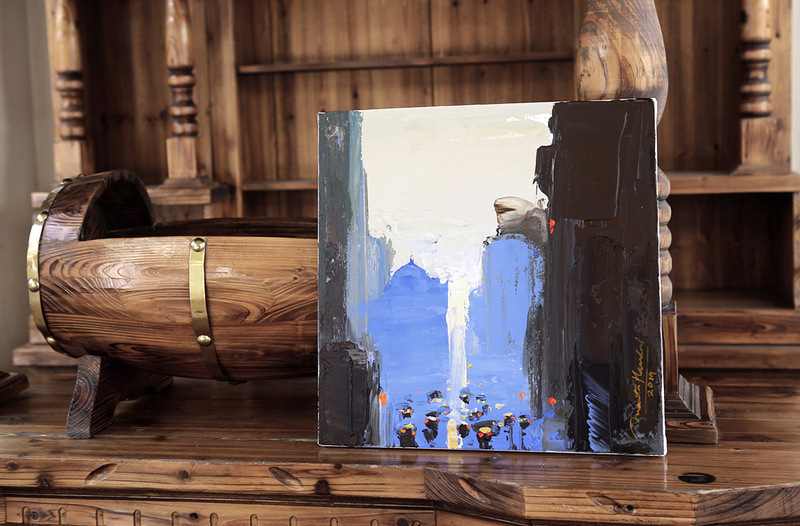 This Art Camp will remain as one of the most remarkable and splendid experience ever in my artistic journey.